The Old Broad Street, London, office of Lloyds Banking Group, held a ‘REACH for the stars’ Event, in 2016. For this culturally and diverse Corporate Event, Ria Meera Munshi, Director of Ri Ri’s Dance Academy, kicked off the day by teaching the Lloyds Banking staff about the nine day, Hindu, celebration of Navratri (explained below), as well as a brilliant Dandiya Dance Workshop. Dressed for the occasion and celebration of Navratri in a dazzling, vibrant, authentic, green, chaniya choli (an outfit inspired by Gujarati culture), complemented with stunning Indian jewellery, Ria then ran a tailor-made interactive Dandiya (stick) dance workshop. This engaging private dance class, additionally, incorporated Speed Networking amongst the colleagues, making the session truly unique! The Lloyds Banking staff took to the London office floor and learnt some traditional Gujarati, Dandiya, dance moves, whilst simultaneously interacting with one another. Navratri means ‘nine nights’ and each night celebrates a different manifestation of the Mother Goddess. Navratri is dedicated to Goddess Durga (Representing power) who fought Mahishasura for nine days and nine nights, eventually killing him. Gujarati communities, around the world, gather each night to celebrate good over evil through Raas and Garba, as well as performing a Puja and/or Aarti during this auspicious Hindu period. The beautiful bang of bells and Dandiya’s created quite an audience at the Lloyds Banking building, with people lined up along the balconies of many floors in the building and peeking out of their office windows, in order to catch a sneaky peak of all the fun dancing taking place. 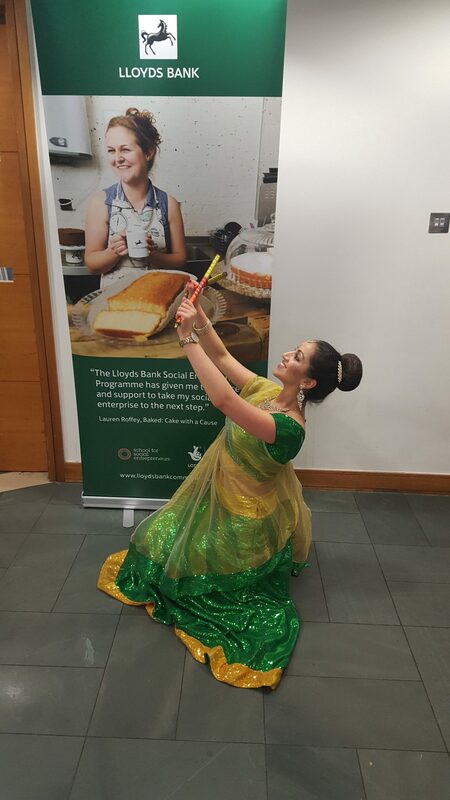 As a finale for the Navratri section of ‘REACH for the stars’ Ria enchanted her Lloyds Banking audience with an energetic Bollywood dance performance, combining a catchy fusion of a number of top Bollywood songs. One hundred and twenty pairs of Dandiya were provided by Ri Ri’s Dance Academy. These were then given as a souvenir to all the dance participants, as a memorable token for the Indian dance and culture component of the Event.